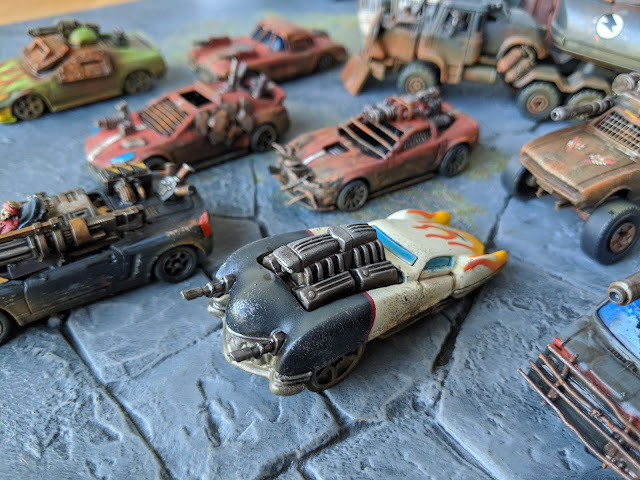 My Gaslands project (originally Dark Future) has escalated rather quickly from a couple of toy cars to a full invasion of my hobby space. What can I say: it is a joy to grab a random toy car, stick on some spare bits and plasticard on and get painting. On the other hand I have to admit I've gotten a bit burned out on the scale for now, and am transiting back to the trusty 28mm scale for my next project. It's the joy of the hobby: obsessing for a month and moving on to the next obsession. Here's my fleet of vehicles. We are killing for guzzoline. Originally I intended to remake Dark Future. I made MDF road tiles and got planning on home made counters. Unfortunately I picked a stone effect spray paint to paint them and it turned out to be a Class A nightmare to work with. The nozzle of the spray-can blocked every time I pushed the spray-button. Instead of spraying well primed MDF tiles in half an hour I spent half a day cursing, sticking a needle into the nozzle and messing around with turpentine to unblock it. Again and again... The tiles have been sitting abandoned in the shed for a couple of weeks now. 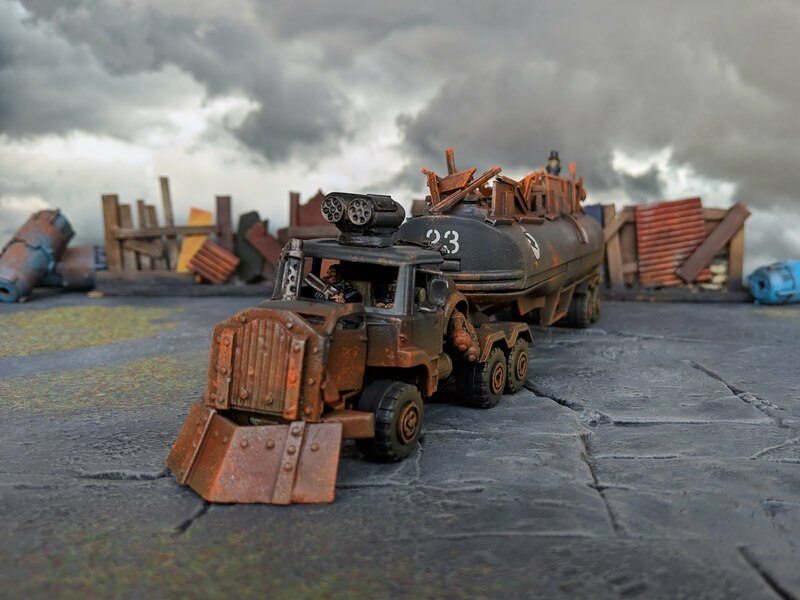 It didn't help that I discovered Gaslands in the process. I've just received the rulebook and it looks like a blast to game (a big plus in my book right now: it doesn't require road tiles). I'm aiming to get in a test game as soon as possible. On a side note, the heavy flamer tanks from GW make for the best Gaslands/Dark Future conversion parts ever. 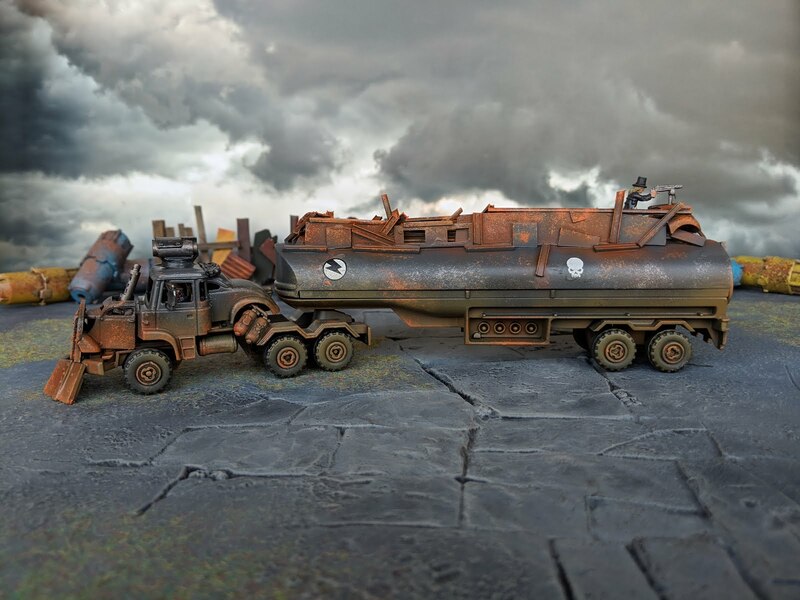 One of the vehicles that absolutely had to be finished was this big rig. I took my copy of The Art of Mad Max Fury Road from the shelf to help guide me making this conversion. Here's a snap of the original vehicle. The retro-futuristic city bus has been sitting around in my bits box. It turns out the windows are almost impossible to remove without breaking them. Cross fingers and help me hope I didn't ruin two highly sought after collector's items. I lucked out and found a VW Beetle shaped Hot Wheels car in my ragtag collection of second hand vehicles. I cut the hood of that thing into three pieces to use as decoration for the war rig (new bonnet, cabin extension and gunner protection). 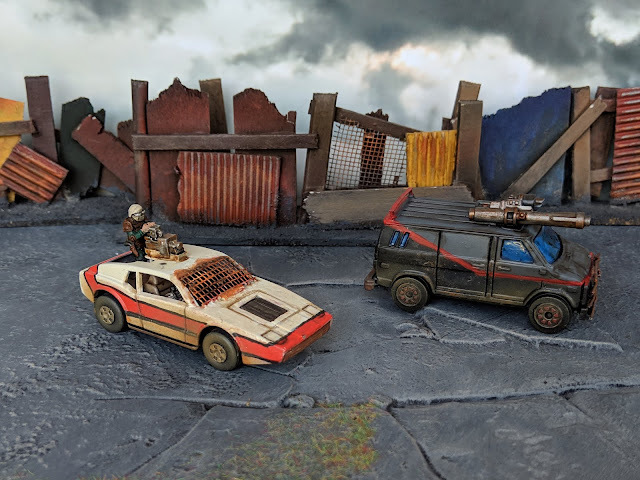 It also contains bits from the 20mm car conversion set by Ramshackle games and plasticard, plastic h-beam and screen door remnants. I've used some GW decals on the vehicle to add a bit of white to the dour orange and black tones. Usually I apply these after sponging on the worst wear and tear but I got carried away and put them on too late in the process. On the upside, they still manage to look dirty enough. Well....maybe I should take a sponge to them at some later point. Decals help if you need to break up a large surface. If you happen to struggle applying decals (or getting them to stay on and look good). You can use Microsol and Microset by Microscale Industries, but in my experience this weakens the decal and makes it rub off even faster during gaming. I think their solution is more geared to scale modelers that safely stick their work in display cases. In a pinch you can also use a bit of thinned down vinegar as this melts decals (in a slightly less controlled manner) in a way comparable to Microset (or -sol, I keep forgetting which does which). I hope this guy has a chin band around that top hat. For gaming I prefer to gloss coat the area where the decal is going to be applied. Converted toy cars need to be gloss coated anyway as it turns out no amount of soapy washing and careful priming make the paint stick all that well. A gloss coat gives a nice flat surface for the decal to apply to. Next you wait for the water to dry and then apply a second gloss coat on top of the decal. After this has dried, that little picture is not going anywhere. When I hit the final stage of painting: a polyurethane matt varnish by Vallejo the decal looks painted on and the transparent edges have disappeared completely. If you're wondering how to apply round decals to shoulder pads (I'm looking at you Imperial Fists) my advice is: don't. Just get conversion bits with embossed chapter logos and safe yourself a lot of grief. 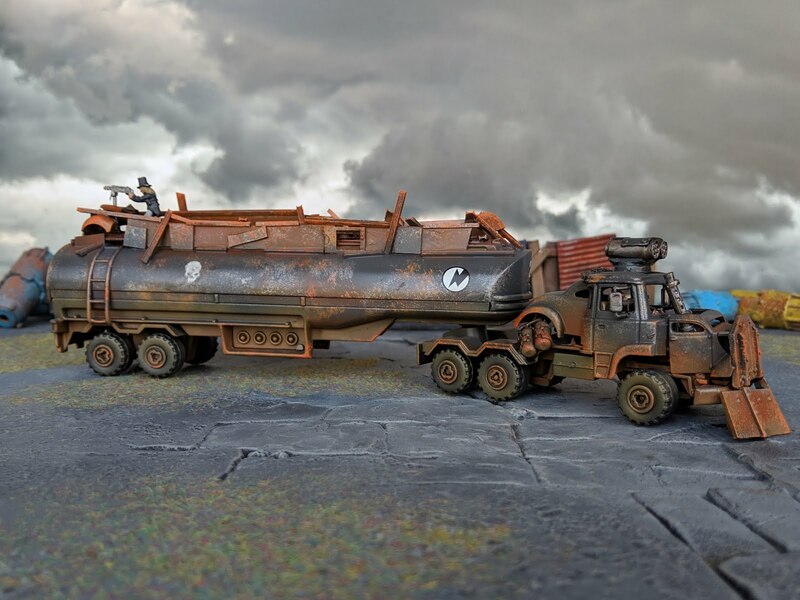 Caravans are a vital part of the post-apocalyptic world. They offer the only way to make the milage on your V8 worse. Here's another example of the 'decal applied in gloss coat' technique in action. Both the hazard stripes and the fists clutching lightning are decals. The flames on the other vehicle where airbrushed with a stencil and then traced in black by hand. The caravan in the back turned out to have a completely modeled kitchen and sitting area inside. I painted them, added a hole in the table and a grizzly tale in blood (for the blood god). Then I glued the top back on and discovered you need to put your eye to the broken window (and stand beneath a very good lamp) to actually see my work. Maybe I could've invested my time a bit more wisely :). I'm very sure there's a story behind this insane car. 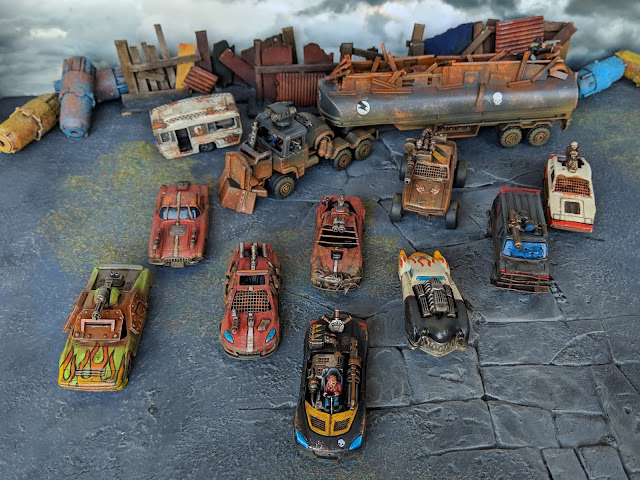 The entire lot of vehicles was converted and painted over the course of about a month (evenings and weekends). 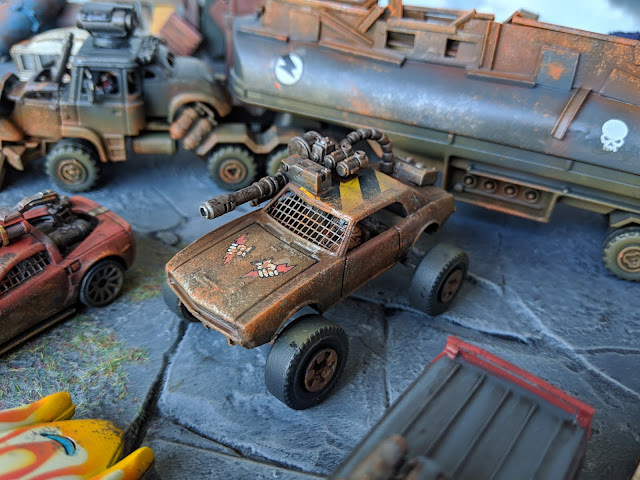 I used an airbrush to give each vehicle a basic coat and then used mostly sponges to stipple on metal and rust colors (all the way up to Ryza Rust for that really popping orange effect). 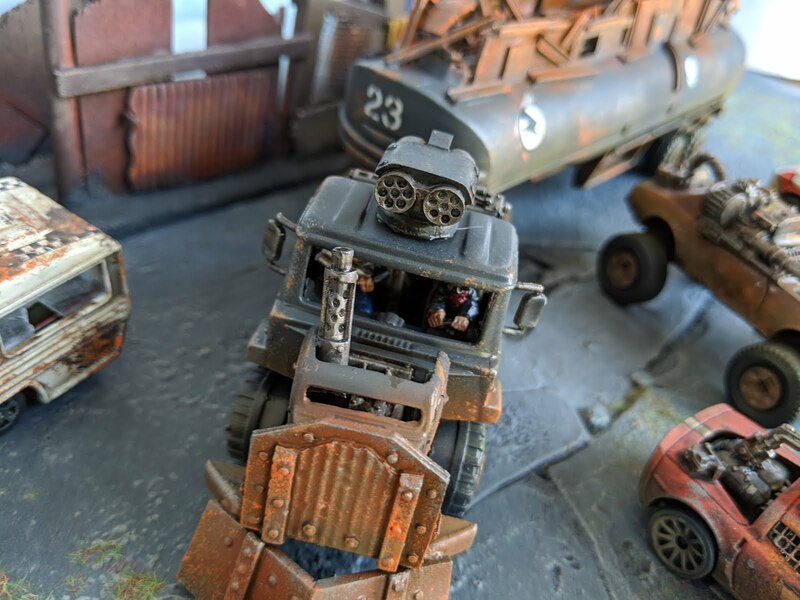 Some of the craziness was my own invention, but the vehicle pictured above was hardly converted at all (only the tops of two lasguns where added). I'm quite satisfied with the flame pattern, but I have to admit I like the Vallejo Aged White even more. I never did realize how well the description of this color matches what it does. I just had to turn an unsuspecting ambulance into the A-Team van. Then someone on the Dark Future Facebook group suggested I add Face's car as well. Challenge accepted (I had to make do as I did not have a 1984 Chevrolet Corvette handy). I would be remiss if I did not get these guys into the post. Apparently they used to be a crack commando unit before being locked up for a crime they didn't commit. They promptly escaped from a maximum security stockade and disappeared into the wasteland...these backstories just write themselves ;). I should at some point find a 20mm scale helicopter and add it to this 'gang'. I think I actually saw rules for flying vehicles in Gaslands. 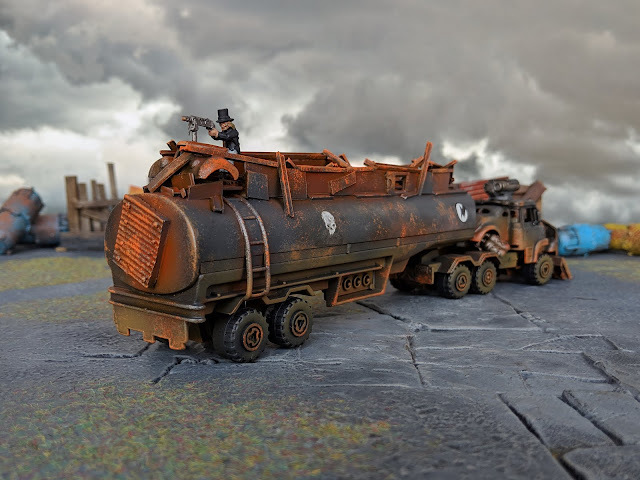 To wrap this post up I've used drivers from both the previously mentioned Ramshackle conversion set and from Stan Johansen Miniatures. 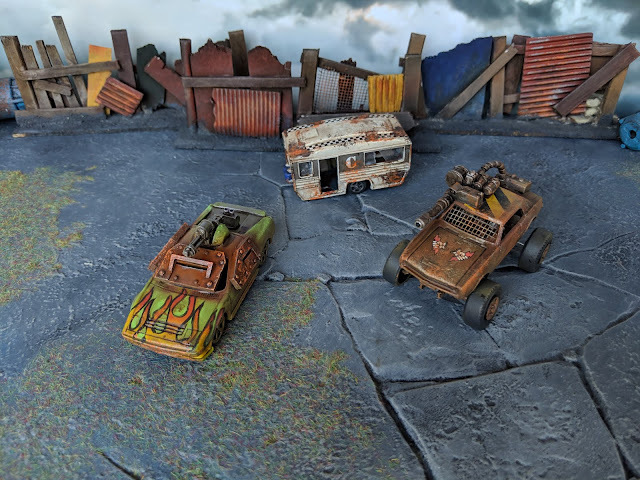 The Ramshackle models don't have lower legs which makes it easier to place them in some vehicles. There's a Ramshackle driver and a guy riding shotgun in the Face-mobile for instance. Both crew members inside the big rig pictured above are by Ramshackle as well. Stan Johansen's miniatures actually have legs. The gunner in the back of the Face-mobile is one of his models as well as the driver of the 'ouch my ears are gone after firing'-car front and center at the top picture of this post. I would be remiss if I did not mention mr. Top Hat on the back of the big rig. He's by Stan Johansen as well and was added as a free thank you with my order. Cheers for that Stan! I spent a few days wondering what color to add over the rust when the answer came to me: no color. Have I ever mentioned how much I like painting rust? Maybe I should write a fresh tutorial on the subject. A little side-note about drivers. I think they really add something to the vehicles, even if its rather hard to see them most of the time (still easier than watching the amazing interior of my caravan, sniff, sniff). I did overestimate my painting talents as 20mm scale is a real pain to paint beyond color-wash-half baked highlight (preceded by a ten minute stare under the daylight lamp while wondering what happened to my eyesight while aging). To get over my inability to add proper detail to small scale models I'm going for a quick foray back into 28mm land (buying Blackstone Fortress helped inform this decision). (Attempted) Edge highlights here I come! 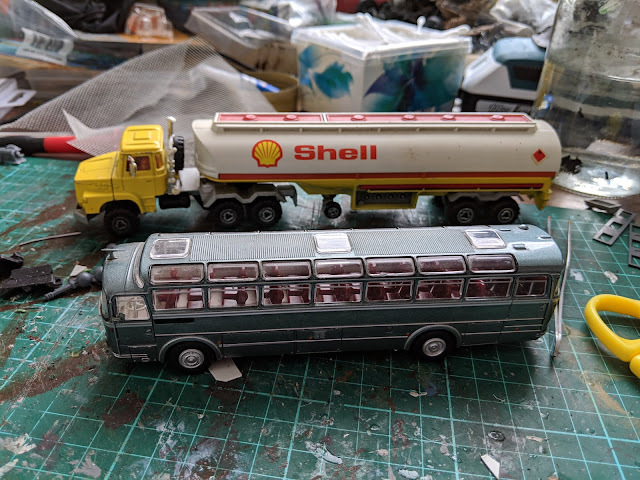 On the other hand I still have plenty of toy cars (and a full gang of Ramshackle bikers) staring at me accusingly, so I will have to get back to this project in a bit. Lets get a couple of games in first. Wow, that's a big bunch of cool cars! The only suggestion I have is, as you noted yourself, to weather the decals some more, they stick out a bit too much. And maybe look into some upgrade wheels for future models (I've seen them in Youtube videos, they make a big difference in the final look). These really make me want to try diecast car modding myself..! Probably not for a while though.. I was a bit surprised by your comments about applying decals. I've used Micro Set/Sol for all my decals (pretty much just SM shoulder pads), and never had a bad experience. Granted, my models sit in a display cabinet, but I can't see why the decals would rub off after they have been gloss varnished. Personally, I like the look of decals more than the 3D-printed pads, the embossing is always too thick for the scale (to my eyes anyway). You're right I should've gotten some wheel upgrades (and I most definitively should take a sponge to the truck's decals one of these days). Maybe I'll pick up some wheels when I start working on the next set of cars. A quick change of painting subject first though. As to the Micro Set/Sol results may vary, and it may very well me. As I tend to be careless/clumsy/frothing at the mouth with enthusiasm while working on my models I tend to accidentally rub the decal before I get a chance to properly seal them in. As Sol/Set weakens them the result is nearly always a torn decal. I could've written that down with a bit more precision. More importantly though: do you have a trick to apply decals to round shoulder pads? I've always had to resort to cutting a gap in with a scalpel and achieving rather miserable results even before applying sol/set/vinegar/gloss on gloss techniques to properly affix it. I'd be very happy to learn if it can be done and how (and I guarantee you I'll try and blog about it afterwords, regardless of my personal succes). Sure, I can tell you my process! It does take some patience, but it's very easy and so far I haven't ripped a decal. 6. With a soft brush, gently dab a big drop of MicroSol on the decal (cover the whole thing). Do not stroke, dab! Otherwise you risk ripping the decal. When you have covered the decal, let the MicroSol dry off (should take like 5mins?). During this, the decal will probably wrinkle a bit. This is normal, do not touch the decal. When the MicroSol has dried, if the decal is not smooth on the surface, apply more MicroSol. I've usually done 3-4 passes.